How is Gross National Happiness (GNH), which started at the time of monarchy, faring in the democracy? 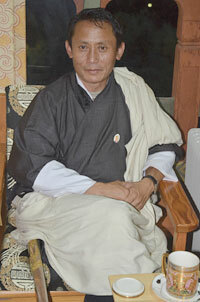 GNH captures the aspirations of the people. It is a tool to better design our policies. So that way, I do see it is in perfect harmony with democracy. Recently, it was reported in media that the draft mineral development policy did not pass the GHN policy screening tool test. Some officials quoted said the criteria used were too subjective. Is that a fair comment? There can be elements of subjectivity in the GNH Policy Screening Tool. We are taking 26 variables from the 72 variables that we have on the GNH index. The purpose of this screening is to ensure that when we make policies GNH related aspects are included. The idea is to enrich the debate and discussions that underpin policies. Otherwise conventional policy making frameworks will only look at parameters like economy, health, education, living standards, and to some degree, environment. One has to see a policy’s impact on community vitality, cultural diversity, psychological well being and time use. Most countries do not look at these aspects. When one doesn’t consider these aspects there are negative unintended consequences. A good example is time use. The idea is you should balance your time between work, leisure and rest. Take the US and France. They have similar levels of productivity but Americans have become richer, the only reason is they work longer. The French recognised the tradeoffs and said “no”. They want the good life. This shows that if you do not consider these dimensions while making policies, you could end up in sticky situations. Our hope is that, subjective as these dimensions may be, by enriching the policy making framework we can reduce the likelihood of unintended negative consequences of not considering them. The way I look at it, this is all work in progress. We are in the early stages of using this tool to guide our development. Objective or not, I cannot see how not having this debate is better, to compare a before and after situation. The policies made in the past were subjective----there are certain people who frame them. Now we have brought some structure and made sure that dimensions important to people are considered when policies are made. We use this tool to bring some due diligence, some rigour, and very holistic. Eventually decisions are made by democratically elected leaders, who then face the electorate. They will not do things inconsistent with the aspirations of the people. So the way I see it is that this tool has added something. Is GNH policy screening toolkit used to screen all policies, say even for a small housing project? The overall plan is to use it for both policies and proposals. At the moment, we have only used it for policies. We are in the very early stages of creating this tool and using it, so we thought rather than spread our resources thin, first we should have a critical mass of experience of using it for policies. Policies are already an area where we were applying a whole lot of tools, but what was missing was this GNH element. In any case, policies have more impact as they are ex-ante, so we thought this is a good intervention. We see this tool as a tool to include, not reject, policies. Though if policies do not pass the GNH policy screening tool, the PM of the country’s first democratically elected government has categorically said they will be rejected. But I’ve always maintained that the reason why we have policies is that absence of policies is worse than having one. You’re working on a policy because there’s a demand for that policy. So all we’re trying to do is make sure that in the considerations that underpin that policy address all the GNH variables of culture, community---all the things that are important to people. Eventually when the policy is implemented, it does not have unintended negative consequences. I do not agree with the idea some people have, that we have come up with this tool which is based on a pre-formed idea, and which we then use to reject policies. No. Presence is better than absence. The tool is used to ensure that policies are consistent with this philosophy of Gross National Happiness, which in very simple terms, means development meets the aspirations of the Bhutanese people, and what they want from life, and that what government does in the name of development, and what Bhutanese want from life must mean the same thing. It must. Given the complexities of a larger country, would a tool like this work in, say India? I am often asked this question. Yes it will, but the content will vary. The idea is to reflect the aspirations of people. In these tools we are trying to bring aspects of development which people consider important but are missing from the policy making framework. So the effort in the various countries is to do what people care about. For us, culture and tradition are very important, because we see this as an important part of one’s well being. Culture and tradition is the foundation. This is a connection that is well established scientifically. Somehow, culture and tradition have been overlooked by policy makers to great detriment, with the result you see a culture of mass media heavily influencing people, marketing, going with brands. In a sense, they’ve lost what they had, which would allow them to say I’m Bhutanese, or I’m Indian. That’s important not to lose. So some other country can take our framework, but will need to add those criteria that they feel are important to their people. But in terms of the approach, I don’t see why not. In Western or other countries, we’re working on democratic ideals, the government is therefore for the people, by the people, of the people. Therefore in their policy making, we would expect they would consider whatever people really care about, and yet to think that important aspects like time-use balance, culture, community, psychological well being are just being ignored. We thrive on social relationships and when they break, there are grave consequences. Yet addressing such problems is not on the radar of governments. Look at cities growing with populations of millions and millions, yet people are getting lonelier. Policies can address such problems. It seems you’re looking for a democratic, compassionate capitalism. Would it be accurate to describe what you are attempting as a more compassionate way of looking at development and the market? This is an alternative approach. Perhaps it’s the influence of our Buddhist heritage, where we always look for balance, and this idea extends throughout. A balance between public and private. Examples of the worldwide financial crisis show what happens when you trust the market too much. It just doesn’t work. Too much of government does not work; too little of it is also a problem. The principle of balance which underlies GNH is critical. We pursue growth, but that growth is underpinned by some policy parameters that we have taken. For instance, carbon neutral growth, keeping 60 per cent of Bhutan’s land under forest cover in perpetuity, or 50 per cent of country being protected areas – these are non-negotiable. Within this, clean technology, sustainable practices, within this we achieve that growth rate and also reduce unemployment, spread benefits to the rural countryside. That’s what we are looking for. We do want growth, because we still have high levels of poverty. But we must go about doing this in a caring, compassionate way. We firstly recognise interdependence, for example no hierarchy between man and nature (growing interdependence). Alternative approach. We hope the approach we have taken, but we have gone through 50 years of so-called planned, modern development, but we still have a strong flourishing culture, clean environment. The model may be very small, but it is a model that is working. GNH seems better suited to a country with either a very decentralized or a very centralized form of governance. I agree. GNH is certainly more difficult in a bigger, more diverse, less homogenous country. But if I were to tell you that GNH is basically about four pillars, (in our more recent reworking of the concept, we have a more precise matrix, where we have nine domains,), and the nine domains go beyond what differentiates people; they are more about what unify people in terms of shared interests. One in five are conventional: health, education, living standards, environmental sustainability and good governance, but the four areas are psychological well being, community vitality, cultural diversity, time use. Now take psychological well being, where we’re just recognizing that mental well being is so important, and even in public health you see talk of moving from primary health to primordial health, and looking at lifestyle as the way to deal with health problems. The rest is about fixing problems after you let them happen. Psychological well being is a stark recognition that irrespective of whether you’re Bhutanese, Indian or Japanese, there’s a physical side to you, and there’s a spiritual side. Our physical side needs nourishment, and all that nations do with economic growth and the GDP is food for such nourishment. But our spiritual side too needs nourishment. Of course, it can come from religious practice, from meditation as a non-religious activity for equanimity. Spending quality time with your loved ones nourishes you spiritually. So when we really talk about that, I think it transcends boundaries, because there’s nothing uniquely Bhutanese there, except for one or two because of our cultural influence, we have for instance, “consideration of suicide” and “spirituality” which we consider important. Otherwise really I can’t imagine why mental well being will not be important. A lot of development is taking us away from this natural order of things, and I think the further we move away from the natural order we are going to see more of such incidents. And community vitality indicator in GNH just recognises that. Within this, an important pillar is the family. If you focus on family for policy making, you can have more optimal outcomes in society. Parents should look after children, and children should look after parents, and not put them in nursing homes. You may increase life expectancy from 60 to 90, but for 30 years they crave company. What’s the point? Like Japan, we too want a life expectancy of 90 at birth, but when we do that we don’t want our old to live in nursing homes and grow old, they’ll still be part of a vibrant community. Such a wonderful way to lead a life. A lot of what you say is out of the formal policy making framework. Why not? Singapore is a very good example. They have a very successful housing policy. Basically, every Singaporean has access to affordable housing. But while they do that, they also are very mindful of keeping the community and family strong. So in their housing policy, when they allot flats and you choose to be closer to your family, then you move up the order of priority to get the flat. Policies have tremendous unintended consequences, but if you do consider the consequences, then there are opportunities to help society along the way you want. Otherwise, you could have a son who stays in the middle of the city because he has a part time job and he keeps crazy hours, and the family lives somewhere else. But if your government intervenes and recognises this, there is so much opportunity. Take time use. Time is life. You want to use it carefully. You don’t want to get into this rat race and when you’re on your deathbed, you wonder, where did all my time go? Why didn’t I spend more time with the people I love and do things on which I can now reflect on. And so governments can play a role in which they can promote the balanced use of time. If governments just disregard this criterion, it can have unintended consequences. We could easily go on this wild economic growth, and have people work all the time, leaving little time for them to spend with their families and keep them deprived of sleep. Both are not desirable outcomes. So within the three aggregates of work, leisure and rest, you try to promote quality. Normally, the whole model is concerned about gainful employment. Increasingly, we feel the need to focus on meaningful employment. Promote policies that help people align their jobs to their values because if these two click, you have a very powerful and productive workforce. Similarly, what can the government do to promote quality time? Of course, some of this we have to do through more subtle advocacy or through new norms we create and some governments can do using its power – for instance whenever there’s a local festival we declare a local holiday. Usually, it’s been shown that when you give holidays, people use that time to do the things that either give them spiritual nourishment or strengthen relationships. Of course sleep is very important too. I mean, we do not want our development to go down a path that people are earning a lot of money, but are commuting three or four hours in a day. This begs the question, what is the purpose, and that’s not the type of outcome. It seems you are attempting to address alienation from a more spiritual, social and cultural point of view. Our whole philosophy is not influenced by left, right or centre. It is influenced by the vision the King had, and this whole idea that let’s benefit from modernisation while making sure the Buddhist way of life continues. And when I say the Buddhist values, I mean those that are timeless, unchanging and eternal---respect, love, compassion and looking after your parents. Last is culture. You could discuss among yourselves the question, ‘What makes us Indian’? You may have many different languages and ethnicities, but I think there’s little doubt that there’s still a basis from which you can say you are an Indian. Diversity could be one. Just reflects what people really care about. I actually think there’s great potential for such ideas to be applicable elsewhere, but you need a group of people to sit and look at this. Most of what you call development is actually a focus on short-term interests and complicated by politics. But this is looking at development in terms of what we really want from life. It totally changes the whole outlook and begins to influence the choices you make. And because we have this outlook, we hope that eventually how things turn out will be very consistent with this. Our chances should be better. We do not see this as an alternative development path. We feel this is the only development path. It’s based on logic and, if you think about it, it is sustainable. If we want a future for our kids, we have to change the way we look at development. Happiness is the basic desire of every person. Has the word happiness been overused? One sees this in posters, in brochures; it’s become a brand. It seems to reduce the complexity of who the Bhutanese people are to just one term---happiness. I don’t think so. It provides a very good overarching term to describe what we are attempting to do here. I can’t think of better one. Take the word economic growth. I think happiness beats that any day. It is more an end, while the latter is a means. Happiness is an aspiration that is common to everyone. By happy I don’t mean smiling all the time; it has to be interpreted in the right way --you don’t want suffering, you want people to be prosperous and live in harmony. We have championed and got a UN resolution passed as the development aspiration. There’s a growing interest in this concept, and hopefully post 2015, this may actually provide the overarching framework under which development goals could be covered. This will then become a shared goal for both developed and developing countries. Because today, it’s almost like there’s nothing else left to be done in developed countries; development is only for the developing world. But from what is happening with development – take climate change, and financial crisis, food crisis and all the things we’re unhappy with, its evident that all of us inhabiting this tiny planet, need to look at things differently, and we feel that having a development aspiration like happiness might do the trick, at least from our 50 years of experience we see it has really helped us make good choices. I would love to learn more about GNH. As a CSR practitioner, I want to find out this can be linked to CSR. I need advice.